The following comment comes from a book describing the experience of an American resident in Florence c. 1890. On the 10th of August Florence celebrates the Festa of San Lorenzo, and according to custom the weather should be excessively hot. ‘As hot as the day of San Lorenzo’, is a saying generally accepted, the sun’s rays possibly suggesting the glowing coals and gridiron of the noble youth’s martyrdom. Seasons may vary south of the Alps, and in Tuscany one summer is no guide for another. Why should the breeze be cool, with a hint of hail recently fallen on the heights, in its breath that enters the Florence Window, rendering agreeable at any hour of the day a ramble across the Via dei Pucci to the Via Cavour, in response to the invitation of San Lorenzo’s bells? The Riccardi Palace is magnificent in stately proportions of massive stone, barred casement, and great iron rings to hold the torches and standards of the Middle Ages, in the light of the summer morning. Venders of small wares, brooms, lamps, bird-cages, occupy the stone bench flanking the spacious structure. There is an unwonted crowd, moving of vehicles, and perceptible hum of voices in all of the streets leading to the Piazza of San Lorenzo; and still the bell clangs out above other sounds. We are reminded that it is the festival of the shops selling pasta; and each is made as attractive in decoration of green garlands, tinsel ornaments, and little flags as the skill and pecuniary resources of the shop-keeper can render them. In the midst the pasta is temptingly displayed, the hard red grain of wheat crushed, prepared, and manipulated into manifold shapes by generations of workers at Naples, Genoa, or Bologna. Here the long and apparently brittle pipes of macaroni are built into gigantic pyramids of interlacing sticks in a window, flanked by the short, tough stems known as padre nostra; there the more delicate white nastrini (‘ribbons’), vermieelli, and capellini – the latter as finely spun as hairs – are arranged in nests and festoons on a shelf, while heaps of tiny golden grains, occhi (‘eyes’), and transparent crescents or stars for soup are piled in bags around the entire interior. 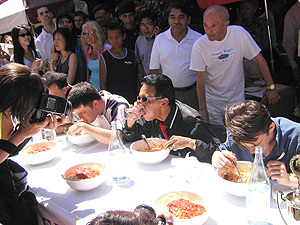 The Italian gourmet will not fail to note the capelli (‘hats’), the small disks of paste to be filled with minced fowl or veal, like Lilliputian patties gently stewed in broth, and served with some subtle flavor of nutmeg, in one of the Case gastronomiche of the Via Porta Rossa, which are ever redolent of ham and sausage. 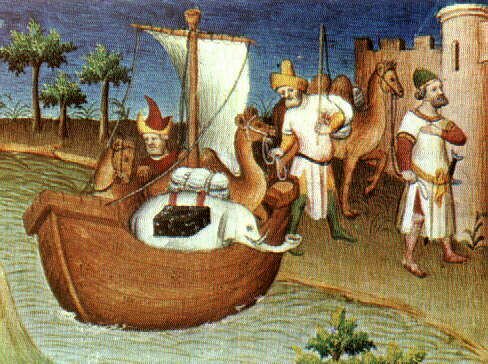 Great wheels of golden Milan butter, the flask of oil, and the odorous Parmesan cheese at hand must additionally tempt a people of a largely farinaceous diet like the Florentines, in such a display. In the Borgo San Lorenzo rises a temple of pasta of fair and accurate architectural proportions, the proprietor of the shop beaming in an obscure perspective of triumphal arches, between columns of twisted vermicelli and with a cupola roof of solid paste overhead. Why is macaroni dedicated to Saint Lawrence by ancient Florence? Is a larger quantity of the nutritious article of food consumed by the town on this day than on any other in the calendar of the year? Was the first Italian who strung the threads in festoons to dry in the air christened Lorenzo? Nobody pauses to answer, and the bells clang on, chanting their own refrain of higher thoughts than mere aliment for the perishing body of man. The following is an article from the Chigago Tribune (1930) announcing a futurist manifesto on food, a manifesto which would lead to the opening of futurist restaurants in Italy. Enjoy the racy Anglo-Saxon take. 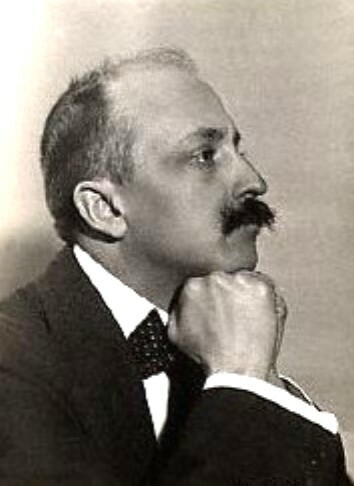 Marinetti, father of Futurist art, literature and drama, has just issued from Rome a manifesto launching Futurist cooking, according to word received yesterday from Paris. Practically everything connected with the traditional pleasures of the gourmet will be swept away. No more spaghetti for the Italians. No more knives and forks. No more after dinner speeches will be tolerated by the new cult. Details of the manifesto, published in the Comoedia, give the principal feature of the new cuisine as a rapid succession of dishes which contain but one mouthful or even a fraction of a mouthful. In fact, in the ideal Futuristic meal, several dishes will be passed beneath the nose of the diner in order to excite his curiosity or to provide a suitable contrast, and such supplementary courses will not be eaten at all. ‘Since everything in modern civilisation tends towards elimination of weight and increased speed, the cooking of the future must be conform to the ends of evolution. The first step would be the elimination of edible pastes [i.e. pasta?] from the diet of the Italians’, Marinetti writes. Modern science will be employed in the preparation of sauces and a device similar to litmus paper will be used in a futuristic kitchen in order to determine the proper degree of acidity or alkalinity in any given sauce. Music will be banished from the table except in rare instances when it will be used to sustain the mood of a former course until the next can be served. The new futuristic meal will permit a literary influence to pervade the dining-room, for with ideal rapid service, by means of a single successive mouthfuls, an experience such as a love affair or a journey may be suggested. Among the new kitchen and dining-room instruments suggested by Marinetti is an ‘ozonizer’ which will give to liquids the taste and perfume of the ozone, also ultra violet lamps to render certain chemicals in the cooking more active. Also certain dishes will be cooked under high pressure, in order to vary the effects of the heat. Electrolysis will also be used to decompose sugar and other extracts. As a model for the presentation of a futuristic meal, M. Marinetti calls attention to a futuristic painting of a synthetic landscape made up of food stuffs by Fillìa. The landscape is composed of a roast of veal, stuffed with eleven kinds of vegetables, placed vertically upon a plate and crowned with honey. This is one of the meals which, under the new system could not be attacked with a knife and fork and cut into haphazard sections before being eaten. Besides the abolition of macaroni, Marinetti advocates doing away with ordinary condiments now in use, and a consistent lightening of weight and reduction of volume of food stuffs. The futurist leader also pleads for discontinuance of eating for pleasure. For ordinary daily nourishment he recommends scientific nourishment by means of pills and powders, so that when a real banquet is spread it may be appreciated aesthetically. The following extract comes from Alex Boese’s outstanding Museum of Hoaxes (Orion 2002) and is a reminder of just how alien spaghetti was as late as the 1950s in much of western Europe. The narration then continued in a tone of absolute seriousness. ‘Another reason why this may be a bumper year lies in the virtual disappearance of the spaghetti weevil, the tiny creature whose depredations have caused much concern in the past.’ Some viewer questions were anticipated. For instance, why does spaghetti always come in uniform lengths? ‘This is the result of many years of patient endeavour by past breeders who succeeded in producing the perfect spaghetti.’ Finally, Dimbleby assured the audience, ‘For those who love this dish, there’s nothing like real, home-grown spaghetti’. Soon after the broadcast ended, the BBC began to receive hundreds of calls from puzzled viewers. Did spaghetti really grow on trees, they wanted to know. Others were eager to learn how they could grown their own spaghetti tree. To this the BBC reportedly [is this really true? ed] replied that they should ‘place a sprig of spaghetti in a tin of tomato sauce and hope for the best’. 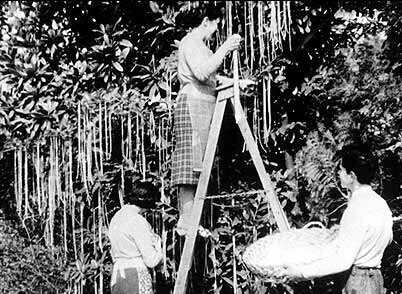 To be fair to viewers, spaghetti was not a widely eaten food in Britain during the 1950s and was considered by many to be very exotic. Its origin must have been a real mystery to most people. Even Sir Ian Jacob, the BBC’s director general, later admitted that he had to run a reference book to check on where spaghetti came from after watching the show. The prestige of the Panorama show itself, and the general trust that was still placed in the medium of television, also lent the claim credibility. The idea for the segment was dreamed up by one of the Panorama cameramen, Charles de Jaeger. He later said that it occurred to him when he remembered one of his grade-school teachers chiding him for being ‘so stupid he would believe spaghetti grew on trees’.